There are very few countries in the world as richly and immediately evocative as Cuba. Just the mention of its name seems to conjure images of charmingly faded colonial buildings, 1950s-era American motorcars parked on sun-soaked street corners, and salsa dancing to the libidinous beat of Afro-Cuban rhythms. Broadly speaking, Cuba attracts two kinds of tourists: those drawn by the fascinating revolutionary and isolationist history of the country, which has withstood over 60 years of communist rule, staunch US embargoes, and the sudden withdrawal of Soviet Union-sponsored subsidies in 1991, to emerge with its unique national character very much intact; and those who want a tropical Caribbean getaway on Cuba's magnificent white-sand beaches, complete with some of the best diving and snorkelling sites in the world, and maybe a touch of vibrant culture thrown in. There is much to see and do in Cuba, encompassing historical attractions, wonderfully charming small towns, beautiful natural surrounds, world-class beaches, and - of course - more hedonistic pursuits, such as cigar factory tours, salsa dancing classes, and more bars and nightclubs than even Hemingway could've been thrown out of at closing time. While it must be mentioned that Cuba suffers from a lack of infrastructure - and might therefore not provide the most 'comfortable' travel experience - those willing to go with the flow will be richly rewarded. The best time to visit Cuba is between December and May, when the days are warm, dry and sunny. Between June and November, Cuba can be very hot, humid and wet - although on the plus side, as this is low tourist season, accommodation will be cheaper and tourist attractions will be less crowded. Read more on Cuba's Climate and Weather. -The Museo de la Revolucion in Havana provides a fascinating introduction to Cuba's colourful recent history. 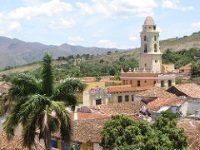 -Sancti Spiritus is a beautiful colonial city, largely untouched by mass tourism. -Even non-smokers should take a tour of one of Cuba's famous cigar factories (Partagas is always a favourite). -Afro-Cuban dance and musical performances are an integral part of Havana nightlife. Read more about Cuba Attractions. -Join the sunset crowds for a walk along El Malecon, a five-mile (8km) promenade in Havana. -Spend the day relaxing on the soft white sand and cooling off in the azure waters of Cayo Largo Del Sur. -Take some iconic photographs of 'Yank Tanks' (50's-era American cars) parked in front of faded pastel-coloured buildings in Old Havana (Habana Vieja). -Visit the extensive subterranean world of Gran Caverna de Santo Tomás. Direct flights to Jose Marti International Airport (located 11 miles/18km from Havana) are available from the UK and now from the US as well, making it easier for Americans to visit Cuba than it has been in decades. Get more information on Cuba Airports. Havana Fever by Leonardo Padura, The Old Man and the Sea by Ernest Hemingway, Explosion in a Cathedral by Alejo Carpentier, and Before Night Falls by Reinaldo Arenas. Buena Vista Social Club OST, Chucho Valdes, Equis Alfonso, Celia Cruz and Interactivo. Buena Vista Social Club (1999), Che (2008), Suite Habana (2003), Dirty Dancing: Havana Nights (2004), and Death of a Bureaucrat (1966). Rum cocktails - including the Cuba Libre (rum and cola) and Mojito (rum, lime, sugar, mint leaves, club soda and ice). Cajita, a plate full of rice, beans, vegetables, pork or chicken and plantains. Che Guevara t-shirts, rum and cigars are obvious and popular souvenirs. Take lightweight clothing, a raincoat, a swimsuit, comfortable shoes as well as sandals, plenty of sunscreen and good insect repellent. The Havana Carnival (July and August) is a street-party like no other, with costumes, fireworks, dancing and musical performances carrying on long into the night. The Havana Jazz Festival (December) is attended by thousands of jazz fans from all over the world. The International Festival of New Latin American Cinema (December) screens the best new independent cinema from Caribbean and Latin American film-makers. More information on Events in Cuba. -Cubans have a higher life expectancy than Americans. -Cuba has one of the highest doctor-to-citizen ratios of any country in the world. -When Christopher Columbus reached Cuba in 1492, he thought he was disembarking on Chinese shores. -Cuba is home to nine UNESCO World Heritage Sites. It is hard to beat a Cuban holiday for hedonistic pleasures and cultural stimulation - the largest Caribbean island promises a very different sort of beach paradise!